Shea butter is an important staple in some of our most popular products. It is in all of our lip balms, hair care products, sugar scrubs, and in most of our lotion bars and bath bombs. We adore this ingredient for its creamy consistency, and skin nourishing, moisturizing, and high antioxidant properties. There is more to love about it though than just the amazing benefits our bodies receive from this oil. We source our fair trade shea butter from Burkina Faso in Western Africa. In Burkina Faso and other parts of Western Africa, it is considered “women’s gold”, since it brings much economic opportunity to rural African women, being that the market is primarily controlled at every level by the women who harvest and extract the oil from the shea nut. 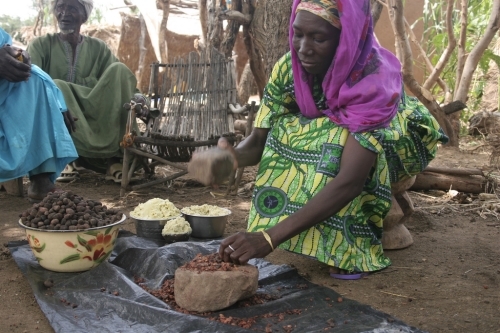 The women harvest shea nuts from the African shea tree (Vitellaria), an important tree in the Burkina Faso ecosystem. 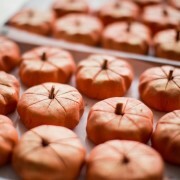 After the nuts are harvested, the women crack open the nuts and extract the inside “fruit” or kernel, then they are crushed, roasted, and ground until the butter has been extracted. This is all very intense work, but is very much a social activity among women within Burkina Faso villages. Not only do the women receive fair wages for their hard work, making it possible to support their families, they are also highly respected for the work that they do in their communities, giving them a voice that they deserve. 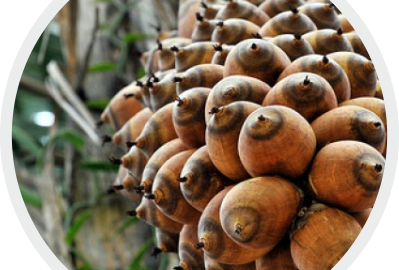 Not only does the African shea tree empower women, the tree and the oil its seeds produce are completely renewable, and are considered one of the world’s most sustainable resources. The trees grow naturally in the grasslands of Burkina Faso and do not require tending, pesticides, irrigation, or fertilizers – as opposed to the palm oil industry, which is riddled with corruption, greatly promotes deforestation, and unfortunately is supported heavily by the cosmetics and soap industries. One of these African shea trees will yield 100 pounds of shea nuts a year, which are picked by hand and transported by foot by the women of Burkina Faso, and will produce nuts for nearly 200 years. These trees are only positive, constantly giving, offering economic benefits in trade, as well as nutritional (as a cooking oil), to these women and communities. This is something that we feel good about, and want you to feel good about too. We will continue to support the women of Burkina Faso, and celebrate them!